by Which Glasses Are Which? "Where are my glasses?" Here! 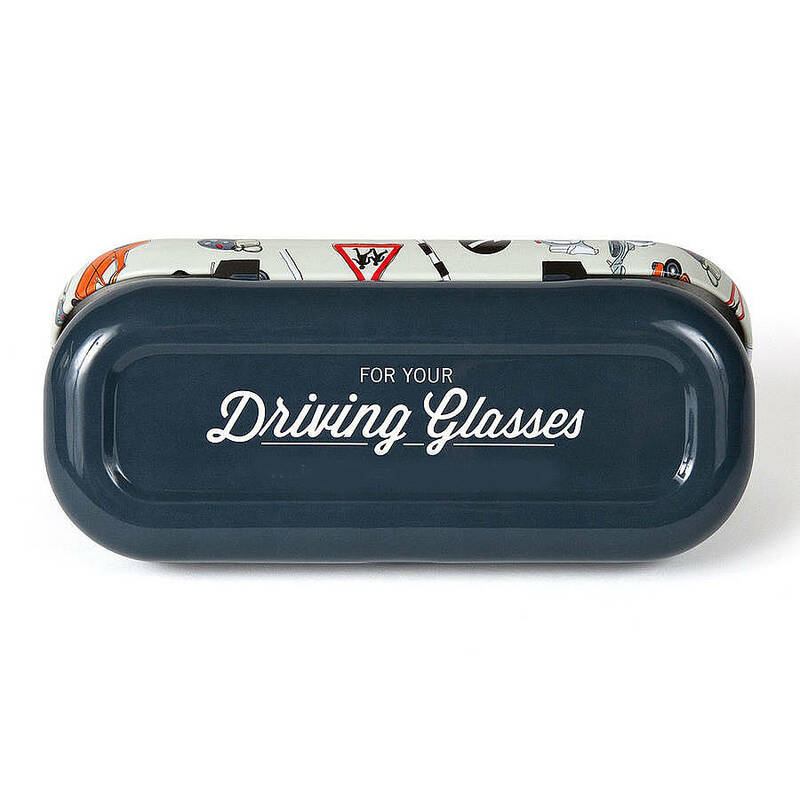 This driving glasses case is a useful gift for hard-to-buy-for dads and grandads, or a fab "little extra". Specially designed for everyone who uses driving glasses, Which Glasses Are Which cases are robust and lightweight. The witty illustrations feature a selection of retro vehicles, roadsigns and driving related stuff - so you can quickly find the right specs! Most people say 'what a briliantly simple idea!' and – having seen various devices people use (generally involving handwritten notes and sellotape!) – it's surprising nobody's come up with this solution before. "I was stuck as to what to buy my father for his birthday. 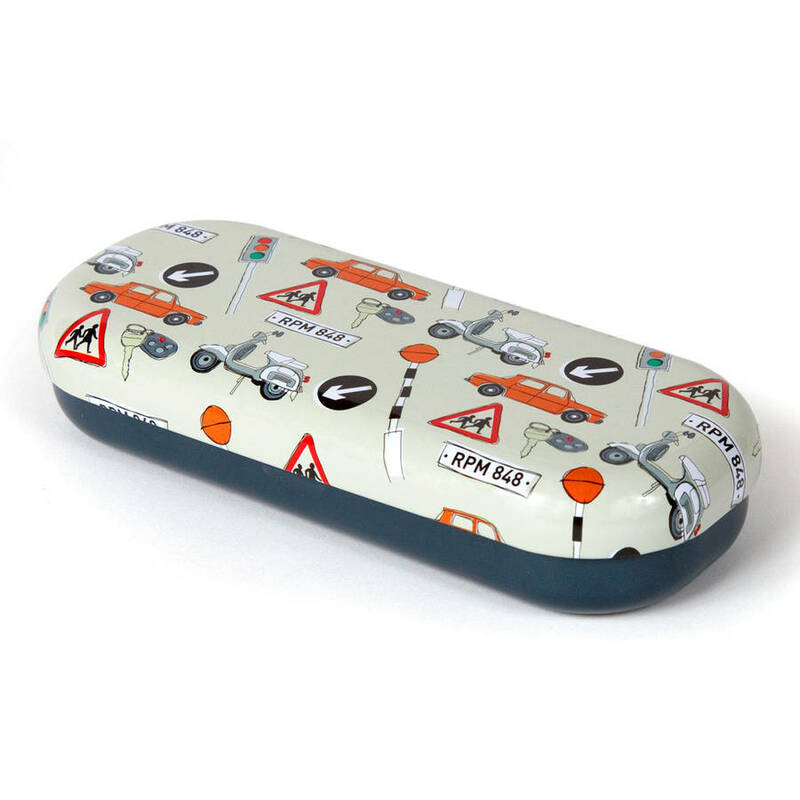 I spotted this glasses case, so bought it as my father is always misplacing his driving specs. He loves it." 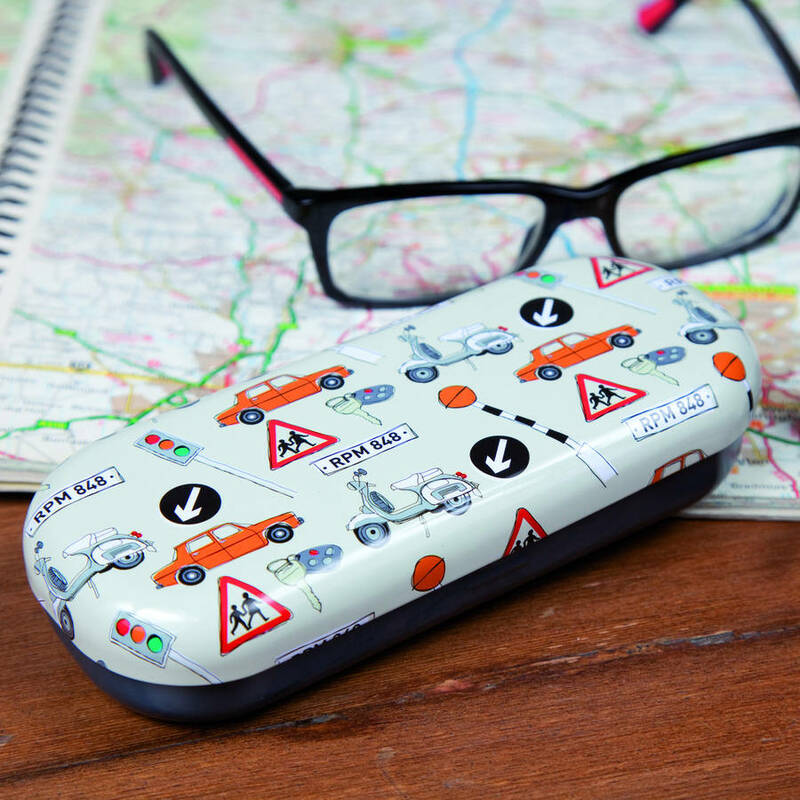 "I love the design of the case and my husband likes it because he now knows where his driving glasses are! Perhaps I should treat him to the reading glasses case as well:) Very quick service." 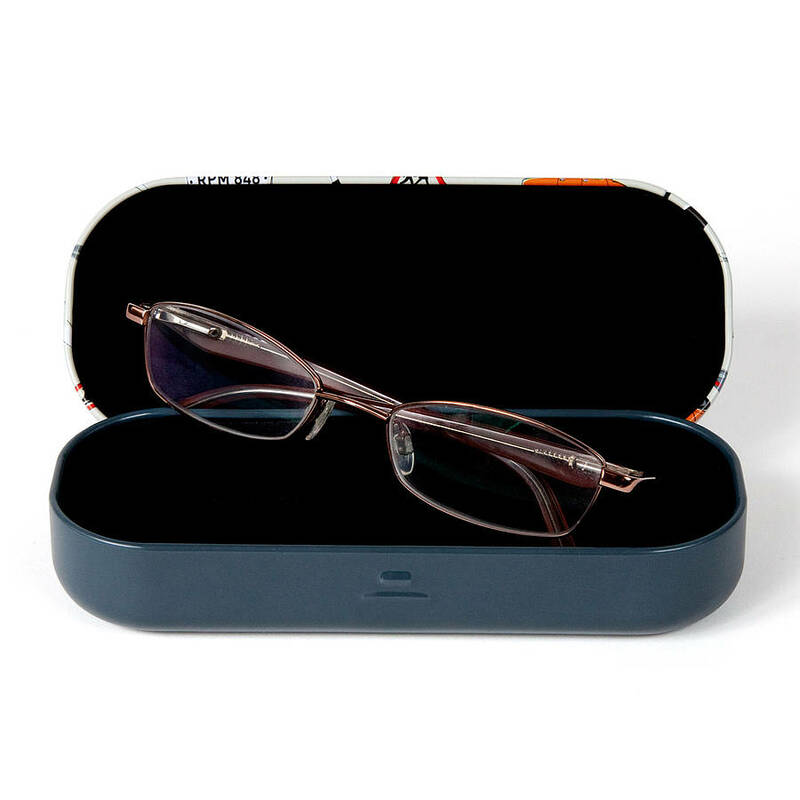 The good quality, rigid, flock-lined case protects glasses from knocks and bumps, or being squashed in a bag. Which Glasses Are Which? cases are designed for daily use, so the illustrations are printed directly onto the tin and then lacquered for protection. 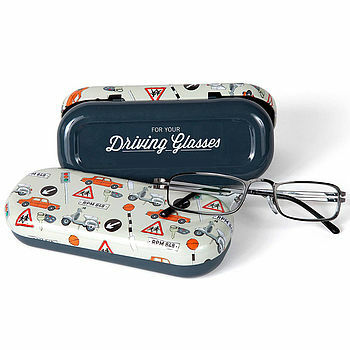 The Driving Glasses Case is part of a range which includes designs for reading and music glasses in answer to the question "which glasses are which?" Invented by an amateur musician who ended up with four different pairs of glasses, the cases have a charm of their own even if you only have one pair of specs to deal with. Designed in the UK and exclusive to Which Glasses Are Which. A personalised option is available; please see our full product range. Our free delivery comes to you via Royal Mail First Class. We will always post your order as soon as we can (generally the same day or the day after you order) but we are then at the mercy of the postal service. 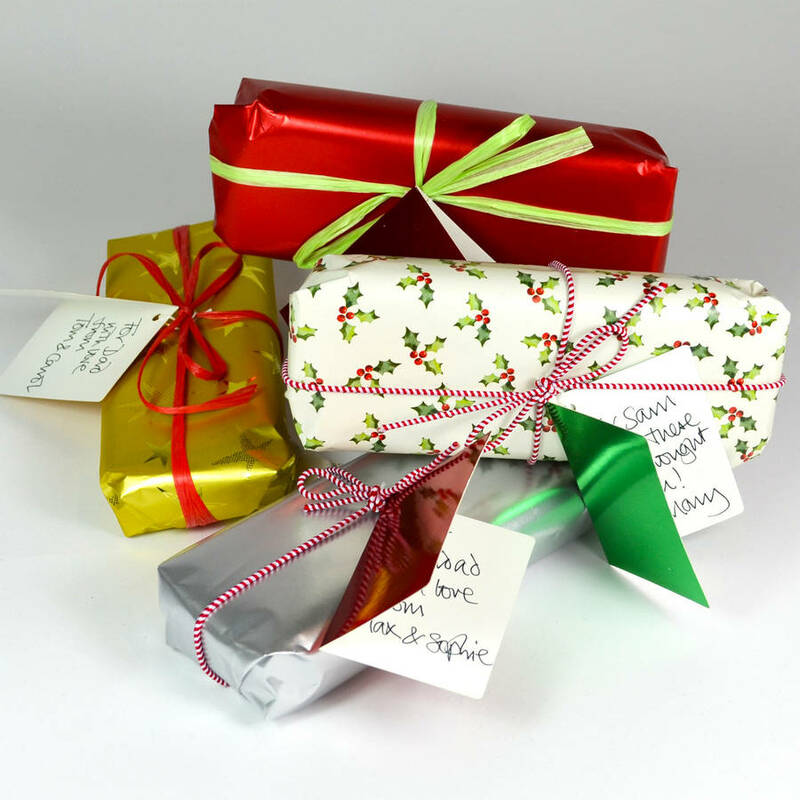 If you need delivery on or before a particular date please choose the Two Day delivery option which we will send via APC Overnight on a tracked service (delivery Mon-Fri). We don't charge the full cost of this extra service, just the difference between ordinary post and courier. Please note this is a signed-for service - if you won't be in please let us know if we should mark your parcel "leave with neighbour" or we can send to your work address if more convenient. Please also supply a phone number (preferably mobile) which we can give to the courier. This product is dispatched to you by Which Glasses Are Which?. Our free delivery comes to you via Royal Mail - we will always post your order as soon as we can (generally the same day or the day after you order) but we are then at the mercy of the postal service! If you need delivery on or before a particular date please choose the Two Day delivery option which we will send via APC Overnight on a tracked service (delivery Mon-Fri). We don't charge the full cost of this extra service, just the difference between ordinary post and courier. More items from Which Glasses Are Which?